The wisdom tooth/dentist saga continues…please make it stop. I was having a decent Monday yesterday until the oral surgeon’s office called and left a rather nasty message stating that neither my social security number nor my husband’s number were associated with anyone having dental insurance at MetLife and that they were going to bill us the visit amount. I don’t know about you but I often visit dental specialists for shits and giggles. If you want to know more about this ongoing story, read my last few posts and perhaps this one. I first called Greg to have him speak with his work’s HR dept and then I called our local dentist to find out if this other office had contacted them as they said (nope) to find that their claim from our last visit (in December) still hasn’t been paid. Then, I called MetLife to find out, what do you know, that we exist but they have the wrong number associated with our account after a year of no issues. It’s off by one number suddenly. The chat with the MetLife rep was hilarious in that it wasn’t funny at all. The rep tried to tell me that the number was correct- as if that is his soc number and that we’re the idiots. Yeah, because my husband doesn’t know his soc number…he’s only had it since he was born and you, rep of MetLife, just saw it on your screen and so you must be right. What was I thinking? This is what happened shortly after the above problem and when Gourmet sent me Vanity Fair for the second time, after telling me they were sending Bon Appetit or rather what happened when I thought that’s what was going on (it was just too much). That poor magazine was my release and didn’t stand a chance. Vanity Fair did have Tiger Woods on the cover and were kind of asking for it though in my defense. That actually added fuel to the rip-the-magazine-apart fire. By the way, I don’t remember magazines being this easy to tear and was quite surprised how quickly the attack went (well compared to say a phonebook…those are hard). I learned the truth, after shredding the magazine, after a rant and after calling another company to get things worked out. Yep, after my rage, I called Conde Nast to be told the actual situation and am pretty sure the lady had a good laugh once we hung up. Vanity Fair is actually a gift subscription from Greg’s Auntie Leslie (who knew) and Bon Appetit doesn’t arrive until March, in place of Gourmet. I’m a dope. I told Greg to sit down for this one (he didn’t listen) and told him the real scenario, where he burst into tears laughing and fell to the floor. I started laughing too once I realized that I am a nutcase sometimes. 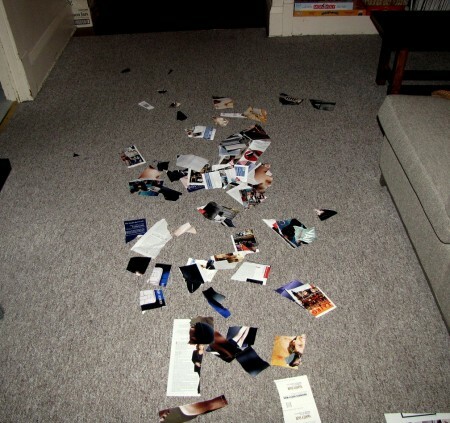 I had no idea that his aunt had done this…look at that torn up magazine, I feel awful…I’m so sorry Auntie Leslie! Thank you for the gift subscription. As soon as I looked at the floor, I said that I wanted to read it…nut to the case. I’m going to cool down with granita. 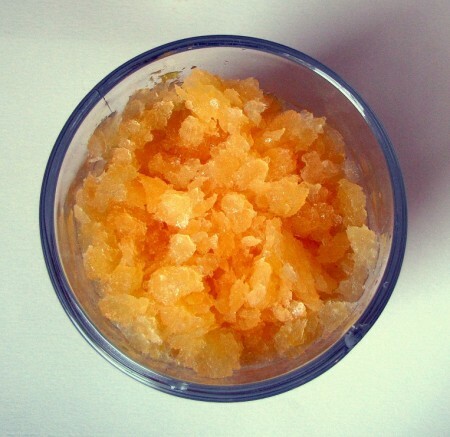 Granita is like Italian ice, often made from sugar, water (together in a simple syrup) and juice/pulp. I saw all these Clementine cuties, in season, at the grocery store and knew I had to make something with this variety of seedless mandarin oranges. A Clementine is easy to peel and sweeter than a tangerine, I prefer it to an orange. I had been snacking on these in the last week, until more than a few began to soften so I made this icy treat from their juice. You can use nearly any fruit juice (or coffee, chocolate and almonds even) to make this adult Italian ice, it is not a Snow Cone, it is much better. Since this is an adult version you could add rum or orange liqueur and no you don’t have to squeeze the juice from the oranges or Clementines, you can use your choice of store-bought fruit juice. Seriously, try these some time with your juice/pulp of choice. In a saucepan, stir together sugar, water and salt, bring to a boil slowly. 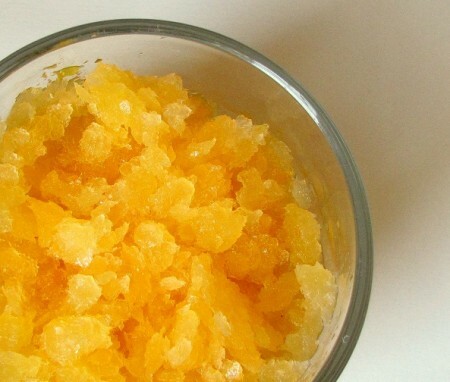 Stir until the sugar dissolves and take off of the heat (this is the simple syrup step and should thus resemble syrup). Allow to cool and juice the Clementines. Stir the juice, lemon juice, pulp, alcohol and syrup together and pour into a metal pan, cover with plastic wrap and freeze for 2 hours. After the 2 hours, break up the frozen portions that are solid and return it to the freezer for another hour and repeat until all is frozen and granular, another hour or so. Make sure to cover in the freezer until ready to serve. 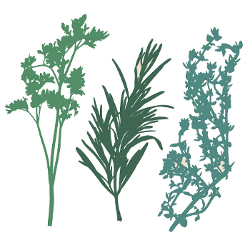 To serve, scrape with a fork to loosen and place into small bowls or glasses. So I’m not crazy! I’ve been getting Vanity Fair too. Making me crazy because it’s so not a magazine I’d ever subscribe to and no matter how many times I try to unsub, I’d keep getting it and getting billed for it. *Now* it makes sense. LOL!